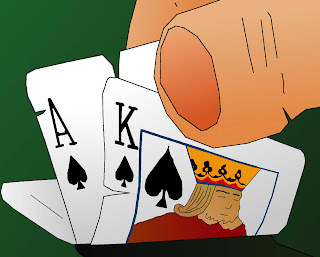 Playing 3-card poker promises the thrill of a fast paced poker game that is fun and easy. You may not win every time but you will definitely have fun trying. An online casino will usually offer the option of playing three card poker for real money as well as just for fun. The option of playing for fun is also in fact a great way of practicing your poker game and strategy. The great plus of 3-card poker is that because the hands are small and there is no further drawing of new cards, the game has a fast pace. Playing three card poker online also has the added benefit of being able to play from the comfort of your own home. It also allows the player the ability to set the pace of his game without having to rely on other players at the poker table or the pace of the dealer.